and here is what I did with it. It would be a great kids birthday card, boy or girl! And most all the images in the set the turtle is from, Fox and Friends from the Occasions Mini, would work with it! Card base is Old Olive with a So Saffron layer behind the DSP. The DSP is from the Tall Tales pack. Old Olive ribbon around the center, Crushed Curry corduroy buttons below the ribbon. Happy Birthday is from the set A Little Birthday Cheer. It was stamped in Old Olive and punched with the Modern Label punch. I punched a second Modern Label from Old Olive, cut it in half, and layered behind on each end. 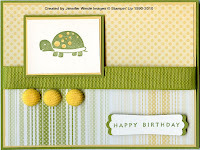 The turtle was stamped in Old Olive on Whisper White and his spots colored with the So Saffron marker. Layered on So Saffron & Old Olive and attached. Quick and easy! Play along if you'd like! !